As an Oculoplastic Surgeon and an Ophthalmologist who has the highest level of training for surgery of the tear drainage system, Dr. Sherman knows the eye anatomy to the highest degree. The tear drainage system is prone to a number of problems from infection to blockage. As an Occuloplastic surgeon with over 20 years of experience, Dr. Sherman is an expert with the highest level of training to treat a wide variety of tearing conditions. Because she is an Ophthalmologist and Oculoplastic Surgeon, eyes are her first priority. Dr. Sherman will help determine the cause of your tearing and discuss the treatment options that are best for you. Tears are produced by the lacrimal gland to moisturize the eye. They normally drain from the eye through small tubes called tear ducts, which stretch from the eye into the nose. A blocked tear duct occurs when the duct that normally allows tears to drain from the eyes is obstructed or fails to open properly. If a tear duct remains blocked, the tear duct sac fills with fluid and may become swollen and inflamed, and sometimes may become infected. Dacryocystitis – Infection of the tear duct. The eye’s tear drainage system collects tears through small openings in the inner corners of the eyelids. The tears ultimately drain into the back of the nasal passages. A small sac within this system rests between the eye and the nose, slightly beneath the skin. Inflammation of the tear drainage sac is termed dacryocystitis (dāk’rē-ō-sĭ-stī’tĭs), which is nearly always associated with infection. 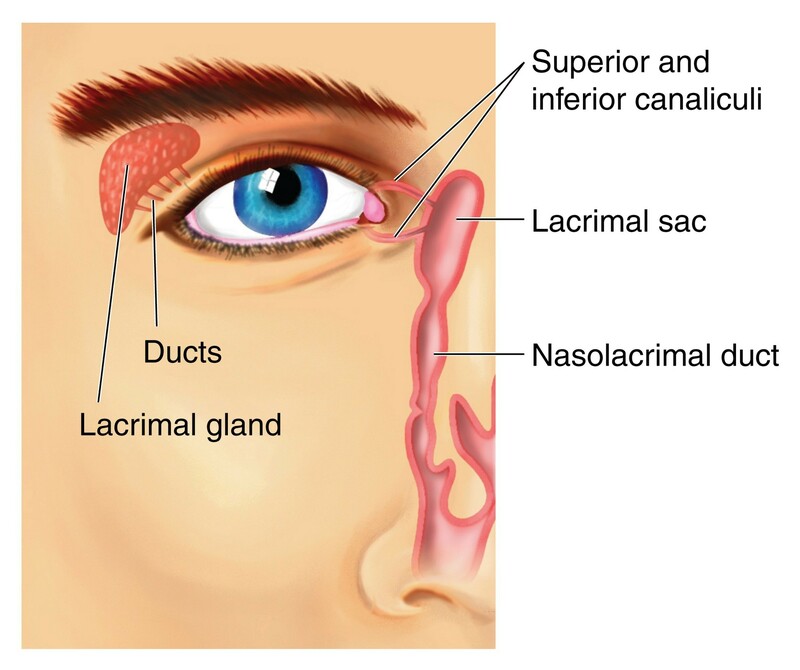 This infection is usually due to a blockage in the tear drainage duct, called the nasolacrimal duct. The eye’s tear drainage system collects tears through small openings in the inner corners of the eyelids. The tears ultimately drain into the back of the nasal passages. Tear duct, or nasolacrimal duct, obstruction can occur at any age. It is more common in women than in men. Initial symptoms of nasolacrimal duct obstruction usually include excessive tearing, with or without infection of the surrounding tissues. If left untreated, risk of infection increases. Note the excess tearing in the left eye due to a nasolacrimal duct. Small openings in the inner corner of the upper and lower lids collect tears and drain them into the nasal passages. These openings may spontaneously close, essentially plugging the tear drainage system and causing tears to run down the cheek. The punctum, or tear drainage opening in the inner corner of the eyelid, is responsible for collecting tears that drain into the nasal passages. When the inner portion of the lower eyelid pulls away from the eye even slightly, it pulls the drainage punctum out of position so that it can longer collect tears. This causes tears to run down the cheek. The cause of your blocked tear duct will determine which treatment is right for you. Sometimes, more than one treatment or procedure is needed before a blocked tear duct is completely corrected. Dr. Sherman will perform a customized consultation, and based on your specific symptoms and findings from diagnostic evaluations, she will recommend the tearing treatment that is right for you. Antibiotics may improve infections around the tear duct; however, tear duct obstructions usually require surgery to open the tear drain. For adults with partially narrowed or closed puncta, a simple office procedure to create a punctal opening may be all that is required. If a tumor is causing your blocked tear duct, treatment will focus on the cause of the tumor. Surgery may be performed to remove the tumor. However, there may be narrowing of other parts of the tear drainage system, such as the canaliculus (the canal that drains the tears in the eyelid). You may also have a partial deep tear duct obstruction. These complications may require surgery at an out patient surgery center to open up deeper parts of the tear drainage system. For partial deep tear duct obstructions, sometimes a thin probe with a soft plastic tube is inserted through the puncta and into the deep tear drainage system. Dr. Sherman would thread the probe all the way out through the nasal opening and leave the soft plastic tube in place to help keep the deep portion of the tear duct open. After the placement of the soft plastic tube, a small loop of tubing remains visible at the corner of your eye, but it is not usually bothersome. Dr. Sherman may recommend leaving the tube in place for several months to enhance the success rate of your surgery. Surgery is usually the preferred treatment for adults and older children with completely blocked tear ducts. Surgery is also effective in infants and toddlers with congenital blocked tear ducts, though it’s typically considered after other treatments have been used. The surgery used to treat most cases of blocked tear ducts is a tear duct bypass surgery. The medical term for this is called dacryocystorhinostomy (DCR). In this surgery, a new tear drain is created above the blockage so that tears can drain into your nose normally again, and it is performed as an outpatient procedure. While you’re under general anesthesia, your surgeon makes an incision on the side of your nose, near where the lacrimal sac is located. After connecting the lacrimal sac to your nasal cavity and placing a soft plastic tube or stent in the new passageway, the surgeon closes up the incision with a few stitches. Depending on the type of blockage, your surgeon may recommend reconstruction of your entire tear drainage system, which is called conjunctivodacryocystorhinostomy (CDCR). Instead of creating a new channel from the lacrimal sac to your nose, Dr. Sherman creates a new route from the inside corner of your eyes to your nose, bypassing the tear drainage system altogether. A man-made tear drain called a Jone’s tube is put into place during this procedure. In 6% of all newborn babies, a portion of the tear duct does not form properly, causing a blockage of the tears with no place for them to drain. It is not unusual for a blocked tear duct to clear up on its own by the time a baby reaches one year of age. To help prevent infection, keep the eye clean with a moist wash cloth. Sometimes, a gentle massage in the area of the blockage will help prevent fluid build up in the duct. If signs of infection develop, your baby may need an antibiotic. If the duct remains blocked after your baby is 6 months to 1 year of age, probing may be done to open the duct. In rare cases, babies with blocked tear ducts have a more severe problem that requires more complicated surgery. Following surgery for a blocked tear duct, use of topical eye drops helps prevent infection and reduce postoperative inflammation. At the appropriate time, you’ll return for removal of any stents used to keep the new channel open during the healing process.